Just you wait, interim CEO and Executive Chairman John Chen is going to turn around BlackBerry just the way he turned around Sybase. This according to Prem Watsa, BlackBerry’s largest shareholder and the latest company mouthpiece to sound off in a campaign to proclaim to the world its longevity in the face of what appears to be a fast dwindling lifespan. In a Wednesday interview with Reuters, Watsa called Chen an outstanding leader, one who is certain to reinvigorate BlackBerry. With the $1 billion in financing that Watsa’s Fairfax Financial has provided it, the dilapidated smartphone pioneer’s turnaround is all but assured. 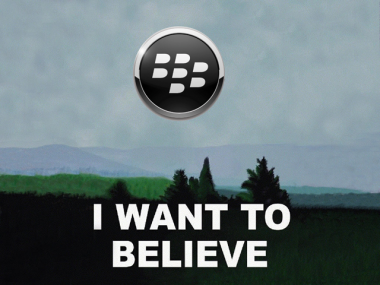 Watsa certainly sounds optimistic about BlackBerry’s chances under Chen. But remember, he was equally optimistic about Fairfax Financial’s chances of taking BlackBerry private in a deal worth about $4.7 billion. “We wouldn’t put our name to such a high-profile deal if we didn’t feel confident that at the end of the day that our due diligence would be fine and we’d be able to finance it,” he said back in September. But in the end Fairfax just couldn’t manage it. Which brings us to where we are now, with the foundering BlackBerry desperately trying to stem the defections of big enterprise clients put off by its ill-starred attempt to sell itself, first with one open letter, then another, and now with Watsa out in the press talking up Chen and the “very significant changes” he’s already made in his one month at BlackBerry. Coming as it does after a sad conga line of horrific announcements from BlackBerry — appalling financial results, massive layoffs and an abandoned bid to sell itself — it’s hard to read these proclamations of longevity and future success as anything but desperate attempts to stanch some very heavy bleeding. Certainly, few seem to be taking BlackBerry or Watsa at their word on this matter. Perhaps Chen really is a miracle worker and he’ll turn the company around. You just need to take “the long-term view,” like Watsa.